Exchange-traded products (ETPs) that allow an investor to short a particular asset class or sector represented by an underlying index have grown in popularity as the market has grown more volatile since the great global credit crisis of 2008. These short or “inverse” ETPs, flat and leveraged, have also been the subject of a lot of debate these days as market participants and regulators have attempted to address the topic with respect to suitability and adequate disclosure for individual investors. We, at Hennion & Walsh, believe that all of the confusion and concern stems from a basic need for the industry, as a whole, to do a better job of educating the investing public about the rapidly evolving marketplace of ETPs, which are made up of both exchange-traded funds (ETFs) and exchange-traded notes (ETNs). For example, the inverse products themselves may or may not be appropriate for long term investors because of their daily valuation mechanism. Inverse products essentially reset every day which is why buy-and-hold type investors are often dismayed when the returns of a given inverse ETP varies so much from the returns of the underlying index. Let’s look at one inverse ETP, the ProShares Short S&P 500 ETF (Ticker: SH), as an example. According to the ProShares website, SH “seeks daily investment results, before fees and expenses, which correspond to the inverse (opposite) of the daily performance of the S&P500® Index.” According to Bloomberg, the S&P 500 index, for the 2-year period ending March 31, 2010 has a total return of -13.86%. Interestingly, SH has a total return of -7.28% over the same time period. Not exactly, the mirror opposite of the return of the S&P 500 Index that a longer term investor might be expecting. However, a long term hedge is not what the product is trying to achieve. This difference gets further amplified for the 2x leverage inverse products and even further for the newer 3x leverage Direxion products. 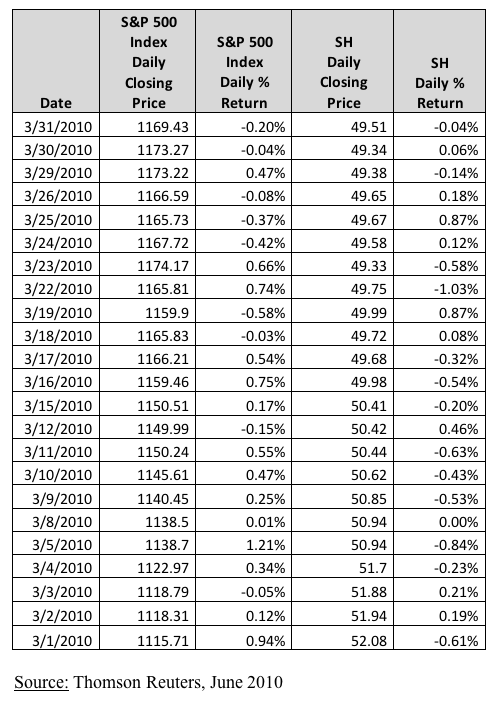 On the flip side, a closer look at the underlying daily performances of the S&P 500 and SH over the course of a given month (March 2010 was selected for example purposes) shows that the product is performing relatively consistently with respect to its stated objective – again, on a daily basis. Hence, for investors looking for short-term hedges against a certain index, these short products may provide for an appropriate solution. On the other hand, investors looking for a longer term hedge against a certain index may want to look beyond these inverse products or, perhaps, consider shorting the actual long ETF for the respective index in question. As I understand it, there is discussion that some product sponsors may be considering coming out with longer term inverse strategies in the future as well. Either way this should serve as just another reminder to investors, and advisors for that matter, to fully educate themselves on the many nuances associated with the multitude of different investment strategies now available in the ETP marketplace.